I'm very happy to be able to invite Pablo Held to the UK once again, this time with his whole trio - made up of the fantastic improvisers Robert Landfermann (bass) and Jonas Burgwinkel (drums). I have known Pablo since I was at college. Having heard each other's playing on the internet (I think Pablo came across my Academy end-of-year recital that I had put on myspace!) we soon discovered our mutual appreciation of pianists such as John Taylor (who taught Pablo at Cologne) and Paul Bley. So it was with great excitement that I invited him over for the Steinway two pianos festival last year to play a duet with me. We played a mixture of my music, Pablo's and other peoples', and we enjoyed this so much we decided to run a double bill trio tour this year - we are playing two dates in Germany (Aachen and Cologne) and two dates in the UK (Brighton and London) and are looking forward to hearing each other's music evolve in the rare scenario of playing back to back gigs. Pablo is a great composer, but also has developed a way of performing with his trio where all 3 of them know each others parts for every tune - so anyone can cue any part of any tune by just playing a small part of it (even if it's in the middle of another tune) - so that they then seamlessly link in other material to the mix. This improvising with form (as well as with narrative and notes) is rare I think - especially in a piano trio, a medium that can often ends up sounding a bit the same. However, they are big risk-takers and are always concerned with developing what they are doing and moving forward. As a result they are very exciting to listen to. For me it will be a fun return to playing with my regular partners Calum Gourlay (bass) and James Maddren (drums). We have hardly played in the piano trio format at all in the last three years since I started the quintet, which was just after the 2010 Mercury Music Awards. We'll be playing a mixture of new things and old things. We - Pablo and I - will playing with both our bands on the 4th December in the intimate atmosphere of the Verdict club in Brighton, and again on the 5th December at the Pizza Express in London (TICKETS). 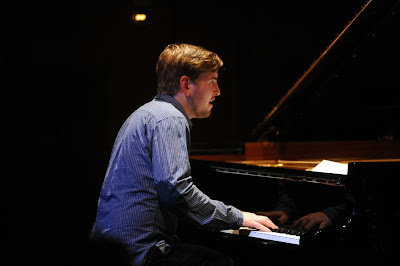 Jazzlines presented the Pablo Held Trio at Symphony Hall in October as part of their ECHO (European Concert Halls Organisation) Rising Stars tour. They were excellent.